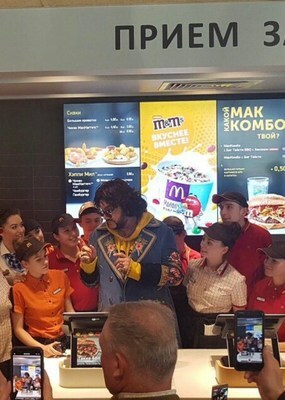 MOSCOW, April 16, 2019 /PRNewswire/ -- Earlier this week, popular Reddit community Accidental Renaissance posted a picture of a tall man wearing a colorful hoodie and denim jacket standing by the cashier in a fast-food restaurant. A few observant Russian users recognized the tall man in the photo as the Russian popstar Philipp Kirkorov during his visit to Minsk, Belarus for his latest tour "Color of the mood" ("Tsvet nastroeniya"). The published photo called "Last McSupper" reminds viewers of Leonardo DaVinci's "Last Supper" mural painting. For a few decades, Philipp Kirkorov has been claimed by Russian media as a 'Russian King of Pop.' The singer is famous among Russian-speaking audiences worldwide for a powerful voice, colorful shows, and his kitschy sparkling style. U.S. Reddit users who saw Philipp Kirkorov for the first time were attracted to the artist's unusual styles and fiery tracks. Philipp Kirkorov is bringing his latest critically acclaimed tour "Color of the mood" ("Tsvet nastroeniya") to Germany in October 2020 also adding Prague, Warsaw, Paris, Milan, Bucharest and London. There is an upcoming European performance will take place at a legendary "Sporting club" in Monaco July 27th, 2019.